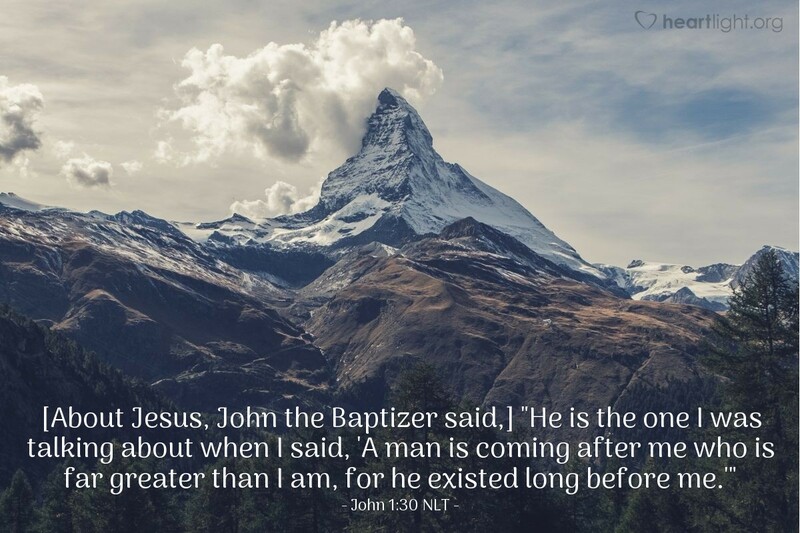 [About Jesus, John the Baptizer said,] "He is the one I was talking about when I said, 'A man is coming after me who is far greater than I am, for he existed long before me.'" What John says in this verse sounds kind of like a broken record (John 1:15, 22-23, 26-27). John the Baptizer doesn't falter or fail in this testimony about Jesus. He remains faithful and true to his task of pointing others to Jesus. He praises Jesus' greatness and trumpets the need of all people to repent (Matthew 3:1-2). He tries to prepare hearts for the Kingdom of God. John the Baptizer shows us faithfulness over the long haul — faithfulness to God, faithfulness to the truth, faithfulness to his mission, and most of all, faithfulness to the Savior and his Kingdom. May such faithfulness be ours! Father, forgive me for my unfaithfulness. Renew a steadfast spirit in me and rekindle my resolve to live faithfully for Jesus throughout all my days. In Jesus' name. Amen.